It’s been a busy couple of days here in Eindhoven for the swim team. On monday my roomie Esther I and I got to see the competition pool for the first time. We had been training in the hotel pool up until then, because the buses the team hired to get us around had steps so we couldnte get on, and no boot to store our wheelchairs. Now the organisers of the world championships have started regular shuttle services with wheelchair access busses for the many competitors and this is how we will get to the pool for our races too. The hotel is starting to fill up with athletes from many different countries, and is starting to resemble a mini united nations with Australia, new Zealand, Brasil, and Portugal here so far. So, back to the pool. The Peter Van Hoogenband pool turns out to be actually called the Tongelreep aquatic centre. It is s huge, and the good news for me is that the building is heated and warm. The bad news is the pool itself is freezing! We have had two sessions there, monday night 6.30-8.pm and then back again at 7am the next morning (so not much time to get my beauty sleep lol). Tuesday morning we practiced our relay changeovers which was really exciting as none of us have raced a relay before. Australia hasnt had a women’s 20point relay team or 10 years! The relay we are swimming is the 200medley relay 20 points. The way it works is that the combined classifications of all 4 swimmers have to add up to 20 (hence the title 20 point relay). Our team is Esther Overton (s3 doing backstroke) Me (sb3 doing breaststroke) Tanya ( s6 doing butterfly) and Jackie ( s8 doing freestyle). Our big race is on August 19th. Apart from training in the pool I have also done a boxing session with my team coach Steve, and a session on the hand crank in the hotel gym ( so excited they have a hand crank never been to a hotel gym with equipment I can use before!). Today – wednesday- was a rest day. I enjoyed exploring the shopping precinct in Eindhoven, and bought 2 long sleeved tops for 7 euro each. I have been freezing here seing as I stupidly thought it was summer and packed singlets and tshirts! We also started eating our meals at the pool (previously we have eaten at the hotel). 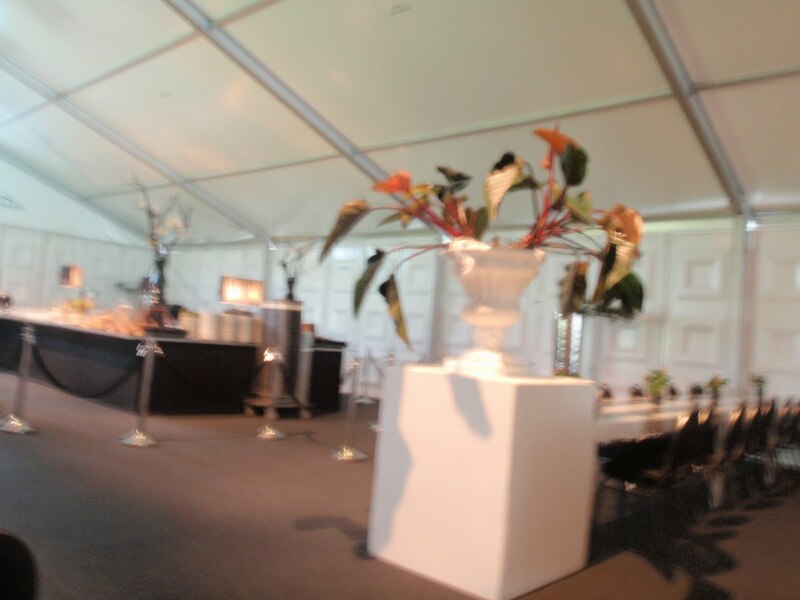 The organisers have set up an AMAZING marquee at the pool for all the teams to eat. It hav2 separate rooms and a lounge area with computers and toiletes etc, then there’s an enormous dining area with lots of funky poty plants and decorations. The only funny thing is you can eat as much as you want, as long as you only have 1 drink! We drove them crazy asking of we could have extra glasses of water if we were thirsty, but it is one drink only! So I’m off to the pool now for dinner, and am taking a water bottle incase I get thirsty lol! Friday the 13th: A crazy day!